What role does gentrification play in Los Angeles? In their essay, "Gentrification in Los Angeles", Marshall Toplansky, Karla López del Río and Ken Murphy examine how gentrification has impacted the polycentric and dispersed city. Their piece is part of the latest report from the Center for Opportunity Urbanism, Beyond Gentrification: Towards More Equitable Growth, which explores how unbalanced urban growth has exacerbated class divisions, particularly in the urban centers of our largest's metropolitan areas. To read or download the full report click here. Read an excerpt of their piece below. Like Chicago, Los Angeles represents a distinct face of American urbanity. It has led the way toward the polycentric and dispersed form that now characterizes virtually all major metropolitan areas. Unlike traditional, monocentric cities, Los Angeles accommodated growth by expanding outwards. Only in recent years has LA experienced gentrification of its older, urban core. The process of gentrification — repairing or rebuilding homes and businesses in a deteriorating neighborhood, accompanied by an influx of the middle-class or affluent — often results in the displacement of earlier, usually poorer residents. One criterion used to quantify gentrification is the movement of people from the 40th percentile (or below) of income to the 60th percentile (or above), a metric recommended by Governing Magazine. Los Angeles has a lack of access to affordable housing, goods, and services in low-income neighborhoods that is arguably worse than in the early 90s, the time of the riots. Many in the area, according to surveys, feel a repeat is entirely possible, if not inevitable. 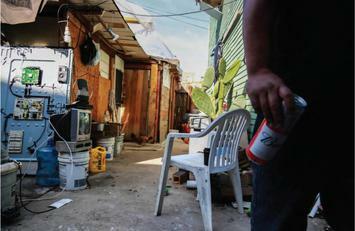 Since 1990, only a handful of LA neighborhoods have experienced gentrification. Within the Los Angeles-Anaheim Metropolitan Statistical Area (MSA), they represent between 1% and 2% of all census tracts. Gentrification started later in LA than it did in Chicago or New York. Spurred by the city’s 1999 Adaptive Reuse Ordinance, massive investment accelerated in the long neglected core. Affected sectors included housing and transportation (notably the subway and light rail lines). In addition, the library was restored, the convention center was improved, and the Staples Center, which cost city taxpayers an estimated $71.1 million, was built. Marshall Toplansky is Clinical Assistant Professor of Management Science at Chapman University’s Argyros School of Business and Economics, and Research Fellow at the university’s C. Larry Hoag Center for Real Estate. He is also Senior Advisor of The Cicero Group, based in Salt Lake City, Utah. A pioneer in the use of big data and sentiment analysis, Marshall is formerly Managing Director at KPMG, and co-founder of the firm’s Lighthouse Center of Excellence for Data & Analytics. Karla López del Río is a community development executive committed to supporting low- and moderate-income families build wealth and thriving communities. Her work fosters public-private-grassroots partnerships resulting in innovative community-led projects, affordable housing solutions, homeownership opportunities, and small business development across Southern California. Karla contributes to the field her insight as a first-generation immigrant, a background in real estate, experience in social enterprise management, as well as a Bachelor’s in Development from the University of California, Berkeley. She has received awards from UC Berkeley’s Blum Center for Developing Economies and NeighborWorks America in the categories of poverty alleviation and community building. Kenneth E. Murphy is the associate provost responsible for leading the academic operations of Chapman University. He is a leader in implementing business analytics at the University with the goal of applying data driven decision-making to academic, business and social challenges. He is the business leader of the university-wide business intelligence project, “Panther Analytics”, as well as a visionary for process improvement and technology implementation projects in academic operations. Additional duties include managing learning and office spaces, hiring of lecturers, scheduling of classes and allocating other academic resources to advance Chapman’s mission of delivering a personalized education of distinction.